I recently read an article on The Colourful Times about used Volkswagens in Ethiopia. Since traveling to Africa, I have often pondered the lot of vintage whips in both Ghana and Morocco. Matt Gibbs’ post on The Colourful Times didn’t talk about the influx of used western cars in Africa. Rather, he compared the tenacity of the Ethiopian people to that of a Volkswagen. Yes the Volkswagen is a great car and so is the Mercedes, but how did so many of them get into Africa? Thankfully, I stumbled upon Jeroen van Bergeijk‘s work, My Mercedes is not For Sale. This book answered my questions about this phenomena and more. Jeroen takes the reader on a journey as he drives from Europe to Africa, in his Mercedes, in order to sell his car. During the journey, he survives sandstorms, encounters dodgy characters, and describes the used car trade in Africa. Jeroen’s journey was different in that he is not in the business of selling used cars. Additionally, he could have sold his car in Europe. So why did he choose to sell his car in Africa? Jeroen, like many, have capitalized on the demand for these cars from the African population. The Mercedes is a luxury car and highly valued – regardless of its condition. Even in America, a used Mercedes carries a weight far greater than a used Nisan. I recall driving my step-father’s used Mercedes on occasion and hearing the comments from friends and family. I barely wanted to drive or ride in the car, but from outsiders I was riding in luxury. Although demand for these used cars is high in Africa, I question the morality and ethics of it. It’s simple supply and demand right? Well, not exactly. In America, there are strict regulations on what cars can and cannot be on the roads. If you fail your emissions test (depending on the state), your car will not pass inspection. Therefore, the car is rendered unsafe and undrivable. I’m not certain the same checks exist in many African nations. As a result, death traps or junk is dumped into Africa and is passed-off as “help”. Jeroen indicated several times in his book that he was doing some good deed by selling his car in Africa. While there are the capabilities to repair the cars in Africa and the cost would be much less than buying a car brand new, at what point are we going to stop letting others dump crap onto the African people. I recall riding in several Mercedes taxis in Morocco and thinking “this will be my last ride in a car ever”. 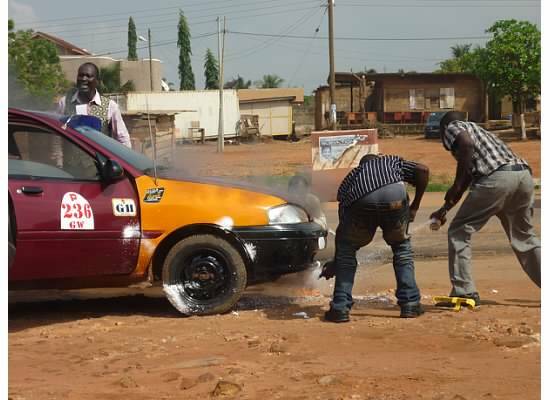 In Ghana, the taxis carry fire extinguishers as the cars often overheat and catch on fire. One afternoon, my ride was interrupted as my taxi driver stopped, jumped out the car, and took his extinguisher to help a fellow taxi driver put out a fire under the hood of the car. I felt sorry for the taxi driver as his source of income diminished in a matter of minutes. A car can bring income and open up doors for many, but at what point can we balance supply and demand in a more ethical/sustainable way? Would love to hear your thoughts! I enjoy writing for fun, reading, traveling, and meeting new people. I'm a mother, sister, auntie, and friend. I write what comes to my mind - its unpretentious, honest, and straight from my heart! Several African countries now have laws (that are respected) prohibiting the importation of cars that are more than a few years old. It’s somewhat hard to regulate the cars already on the streets, but in time progress can be made this way. Thanks Dana. True – progress can be made! Those laws are easily circumvented. In Ghana for instance, cars are chopped up in parts and reassembled inside the country. Corruption is rife, savvy car dealers know how to get cars into the various countries. I believe citizens of African nations are ill served by those laws. True, most cars driving around in Africa are extremely unsafe but that didn’t change any with the prohibition of the importation of older cars. A better (if perhaps in an African context unrealistic) solution would be to inspect the cars when they get imported. Or even better, make sure every car gets a regulare checkup. The age alone doesnt tell you much about a car. Most imported used cars are way better than what people can buy at used car dealer inside these countries. That’s why these imported used cars are so highly valued. A car straight from Europe is simply the best deal you can get. Because, cars get old pretty soon in Africa, and people keep driving them because there’s no alternative. In the end most Africans can only afford used cars and those cars are important for economic growth, the only solution for a better life ordinary people from Ghana, Burkina Faso, Senegal etc. I am not denying these cars are a huge problem: they’re unsafe, they’re polluting like crazy, but you have to balance the good and the bad I guess. And to state “at what point are we going to stop letting others dump crap onto the African people” sounds extremely paternalistic to me. Let African people decide for themselves what they want and don’t want. Thanks so much for reading and responding!! That is awesome. But I do want to clarify. I am not saying that I or any western country should make the rules for what is allowed in any country. I do whole-heartedly believe in the self determination of any group of people across the globe. But as a global community, do we have at minimum a moral responsibility to try to make sure that the ‘help’ we are giving has more long-term benefit than short-term gain. For example, we can give a country trillions in aid loans, but the interest on that debt may cripple the economy even further. In this example, the ‘help’ is really a hindrance in the long-run. I do feel that as a global community we should work together to make improvements all around. I have talked to people who believe that “crappy” cars are literally dumped into their countries. Why do we question China importing cheap, non durable goods across the globe. Yet, we don’t question the importation or ‘dumping’ of junk cars. I am not referring to the organized car trade. I have a bit of insider knowledge as I live in Ghana and myself/husband/family have all bought used/accident cars to ship/fix and use in Ghana. There is a law in Ghana that makes it difficult and super expensive to import a car older then 10 years into the country. The majority of people who CAN afford to buy a used/accident car in the US/Europe, pay the shipping and duty/clearing fees have no intention of purchasing a car 10 years old. Buying a slightly/moderately used car in Africa is about as equivalent to an American going into a car shop and buying a new car in the US. If you go on any website the purchasing power of the African middle class is not that of the American middle class so buying a NEW car is out of reach for the majority of middle class Africans who have good jobs. And buying a used car is not necessarily bad. I bought my Nissan Rogue when it was just a 1 year old and less then 10k miles on it. I had to do a few minor repairs – body work and I dont consider this to be ‘unethical’. The majority of middle class Africans purchase cars that are in safe working order. The cars that ARE unsafe in Africa tend to be the minivans that transport people, articulator trucks and some of the older model taxis. As time progresses these vehicles will be phased out of the system. But for a Westerner to say that people are ‘dumping’ the cars in Africa is completely wrong. There is a HUGE demand – my coworkers are all asking me to get cars for them – but cars that are no more then 5 years old. It is unfair for a Westerner to use their criteria for Africa. It is up to African people and their governments to decide what they will and will NOT allow in their countries – for another country to decide for them is simply wrong and paternalistic. I am not saying that we, the West, should make rules for any country. I do know there are regulations already in place in many countries. The problem is, the rules are often circumnavigated. As a result, you have older model, unsafe vehicles on the road. My absolute scariest moments were riding in taxis and on the buses in Africa (partly because of the driving and partly due to the fact that I thought the car would fall into pieces at any moment). I can’t even begin to describe the condition of the buses in Morocco.